I loved Camp Boyfriend and as soon as I started Camp Payback I was so happy to be back to Camp Juniper Point. Having never been to camp myself and being a big fan of nature, the setting is an insta-win for me. 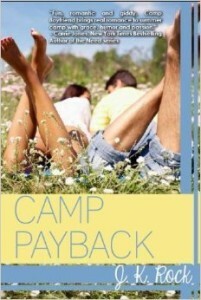 Camp payback is different from Camp Boyfriend, but I loved it just as much. Camp Payback has a different main character from camp Boyfriend. This time Alex is the main character together with the love interest Javier. I thought it was awesome this book was told from both their point of views as it really added something to the story. What I loved most about Camp Payback might be the last few chapters, I love that moment where everything comes together, people grow and change and become stronger. I don’t want to spoil anything, but those last few chapters where so good and I love the message this book gives their readers. I also liked getting to see some of the same characters from the earlier books, Alex still had most of the same bunkmates as Lauren did in the first book. And I especially liked seeing the glimpses of Julian and Hannah after reading Camp Christmas. I didn’t like Yasmine at first, but I did end up liking her later in the book when some events happened that made me see her behavior in a different light. One thing that bother me a bit was the reason why Javier got to Camp, it just seemed a bit weird he could skip the Foster system for a few weeks Camp. Another small issue was the movie set scene, it just seemed a bit off how they could so easily get jobs as extra’s. I don’t know anythign about movies, but it seemed a bit too easy. But those minor things didn’t distract from the plot and I really loved this book! To conclude: I loved being back at Camp Juniper Point in Camp Payback. This book has a new main character and it’s told form both Alex and Javier their point of view. I really liked the double point of view. Just like the first book this one has a great story, lots of character growth and a great message. I can’t wait for the next book in this series! I really enjoy this series, it’s the perfect summer read and I am really looking forward to the third book in this series. I hope you’ll enjoy it!